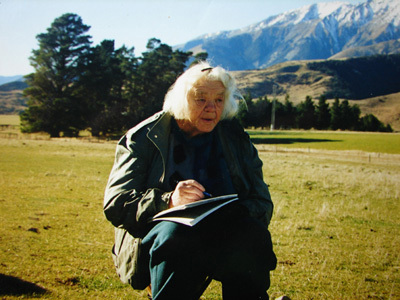 Yvonne Rust, QSM, was a New Zealand pioneering potter, passionate arts teacher, and in later years, a prolific painter. Born on 19 November 1922 at Awarua in Northland, Rust was the only child of Gordon and Annie Rust (nee Buckhurst). Gordon was a Native Schools Headmaster among Maori, and his wife, Annie, was an accomplished artist who had been a tutor at Canterbury College of Art (today, Ilam School of Fine Arts attached to Canterbury University). Yvonne’s early years were spent amongst Maori, and from 1928 in Te Hapua, New Zealand’s northernmost community, where she found herself the only white child. She spent most of her time with young Maori outside in the natural environment, riding horses, digging shellfish, eeling, climbing trees, fishing, doing what they did. This led to her Maori perception of the natural world; that it was a living body, imbued with spirit. This perception remained with her for the duration of her life and it informed much of her work as she moved into art. She graduated in 1946 with a Dip.FA from Canterbury College of Art and began teaching art in secondary schools just as art was being introduced to the general curriculum for the first time. At an art teacher’s refresher course, she was mesmerised by clay from the moment she saw a pottery demonstration by Robert Nettleton Field in 1949, and began a life-long fascination with clay and pottery. In 1956 she set up the first National Pottery school which attracted 80 students and included tutors, Mirek Smisek, Patricia Perrin, Marion Mauger and Carl Vendelbosch. In 1965 she hosted Japanese Master Potter, Shoji Hamada, as part of the Christchurch Arts Festival. She moved to Greymouth on the West Coast of the South Island in 1966 and introduced pottery as a new income stream. Rust was presented in 1968 with the Silver Medal for Services to the Arts by the Canterbury Society of Arts. In 1971 she moved to Whangarei in Northland. After constructing an earth house, she instigated an Earth-Building Code, which is today cited on every earth-building in the country. She also instituted the Earth Building Association of New Zealand (EBANZ), and that is today the only owner-builder voice in the country. In 1972 Rust received a Fellowship for Services to the Arts from the QEII Arts Council, and in 1975 she was made an honorary member of the NZ Society of Potters. In 1981 she set up the Quarry Arts Centre in Whangarei. It was set up as an arts resource centre, but also as a place where experimentation could be carried out on New Zealand’s raw materials/natural resources. Today the Quarry is a well established arts centre which runs the popular annual Summer Do, instituted originally by Rust. The Summer Do brings in expert tutors from around the country to run workshops in a variety of disciplines from earth-building, to painting, singing, screen-printing, sculpture, pottery, and many more. Rust was awarded the Queens Service Medal in 1983 for Services to Pottery and the Arts, and in 1989 Yvonne Rust, QSM was awarded Life Membership of the Crafts Council for her contribution to art and craft education. 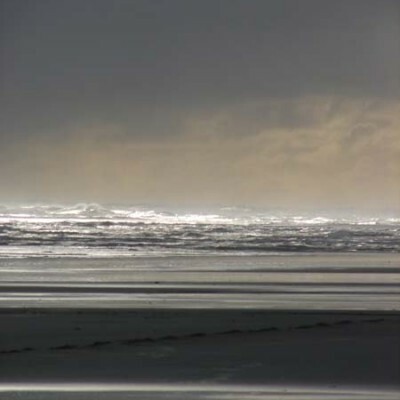 She moved back to her beloved West Coast in 1998, and established the Yvonne Rust West Coast Arts Trust there in 1999. She died on 26 June 2002 in Greymouth. Her legacy, apart from huge bodies of work in pottery and painting, is in the artists across a wide range of disciplines who today continue to contribute to New Zealand’s culture and heritage. Amongst them: architects, potters, painters, jewellery designers, theatre directors, ballet dancers, arts educators, ceramic artists, and many more. 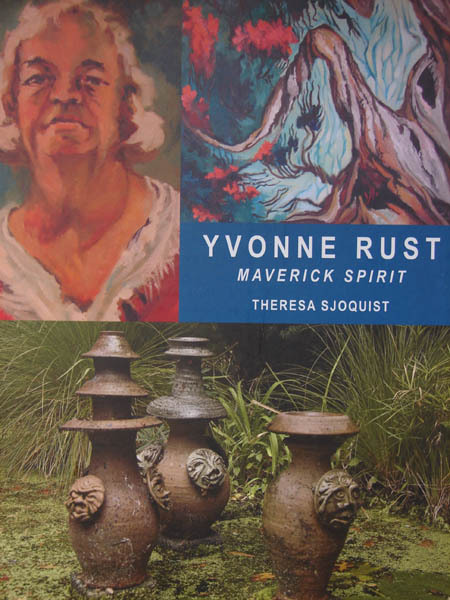 Yvonne Rust: Maverick Spirit is the detailed biography of this eccentric and original thinker who had an enormous impact on New Zealand culture. The book is available as a lavishly illustrated coffee table style book published in print by David Ling Publishing. Also available as a fully illustrated eBook.